This was one of the most rewarding and humbling experiences that I've had in my life. I decided to put together a body paint book featuring Cancer Survivors. All the body paint models, who ranged in age from 3 - 55 had fought or were currently fighting cancer. I was privileged enough to paint Hunter. Hunter is an 11 year old Wonder Woman, those are the best words I have to describe her. "In February 2013, Hunter was diagnosed with Stage 3 Small Cell Ovarian Cancer. She was 11 years old, and given a 6% chance of survival. During the next 10 months, she went through 6 chemo sessions, 4 surgeries including a full hysterectomy, 28 radiation treatments, a bone marrow transplant, and countless scans and blood tests. It was a tough fight, but on December 3rd, 2013 she was announced cancer free. But that doesn't really tell you much about Hunter, just her cancer. Though physically still weak from the treatments, Hunter is one of the strongest people that has ever put on this earth. Through it all Hunter has always looked on the bright side of things and pushed forward to a better future. Rarely did she ever make a complaint about the procedures she went through, only wishing that the other kids with cancer didn't have to fight this fight. Even during treatment she personally worked on raising funds to help other cancer kids. Hunter's smile is infectious, and her laugh is a pure treat to hear. She is one of those rare kids now-a-days that don't hide behind a mask of uncaring. For her every moment is a gift, and she lives them as fully as possible." Those are words from Hunter's Mom. 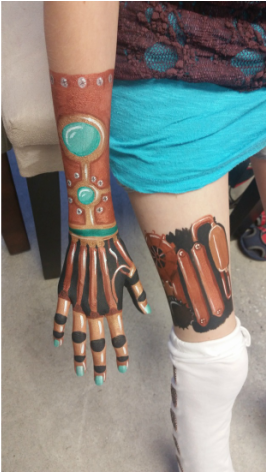 We asked each model to find something that was precious and important to them to work on as their body paint. When I asked about what Hunter wanted to do, this is what she said. "Hunter has had a few super hero names throughout all this, she started with The Red Coyote, and in now liking Techno Girl. She would like to do the photo shoot with a Techno Girl theme." So we made Hunter a super fierce, Steampunk Superhero, Techno Girl.